In the following short video you’ll see the whole process of adding Visual Composer to a Category. Below you’ll find also step-by-step instructions highlighting some details. First of all you need to add Visual Composer field to your Field Group. Refer to this article to see how to add Visual Composer field and this article to see how to create Field Group. Under Field Group’s location rules, choose: Show this field group if “Taxonomy term” is equal to “category”. Now when Field Group created, targeted at category and has Visual Composer field added, you can go to edit the category you want and set your content. This option definitely gives you more flexibility, because you precisely control what, how and where to display. To render Visual Composer field, you do it absolutely in the same way as you display all other ACF fields. Note: Since this field will be rendered on taxonomy term page, you’ll need to set post id properly. See this post for more details. Don't have WP ACF-VC Bridge yet? Get a must have plugin for modern WordPress website today! Why Visual Composer Not Loading in ACF Field? How to Append ACF Fields to Child Product Categories only? 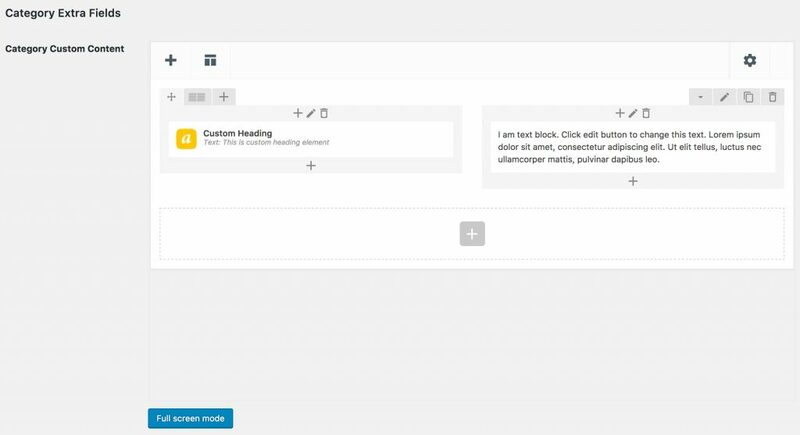 How to create ACF Options pages from WordPress admin?